This is an excellent book, requested to make control circuits easy to understand for the electrician that is unfamiliar with controls. This is a very troublesome area on the exam for some. This book has all the control questions I've seen asked! The Control Circuits Workbook is also included in our master exam combos. New chapter on computerized estimating methods. Extensively updated, this industry-leading text includes the latest motor control and integrated systems technology for instruction of advanced manufacturing skills. The latest test tools, safety practices, and technology have been added to complement the advancing technology of motor starters, motor drives, PLCs, and control devices. Essential troubleshooting procedures are integrated in each chapter and electrical safety has been expanded throughout to address new NFPA 70E requirements. Each text contains a CD-ROM with Quick Quizzes™, an Illustrated Glossary, and Reference Material. These activities enhance the content to provide additional information and assessment. The workbook provides worksheets for each major concept presented in the text. Typical applications and standard circuits provide the background required to work in the electrical field. For review, a Tech-Chek follows each chapter. Like taking a class in how to estimate materials and labor for residential and commercial electrical construction. Written by an A.S.P.E. National Estimator of the Year, it teaches you how to use labor units, the plan take-off, and the bid summary to make an accurate estimate, how to deal with suppliers, use pricing sheets, and modify labor units. Provides extensive labor unit tables and blank forms for your next electrical job. forms for your next electrical job. 2018 year's prices for installation of all common electrical work: conduit, wire, boxes, fixtures, switches, outlets, loadcenters, panelboards, raceway, duct, signal systems, and more. Provides material costs, manhours per unit, and total installed cost. Explains what you should know to estimate each part of an electrical system. 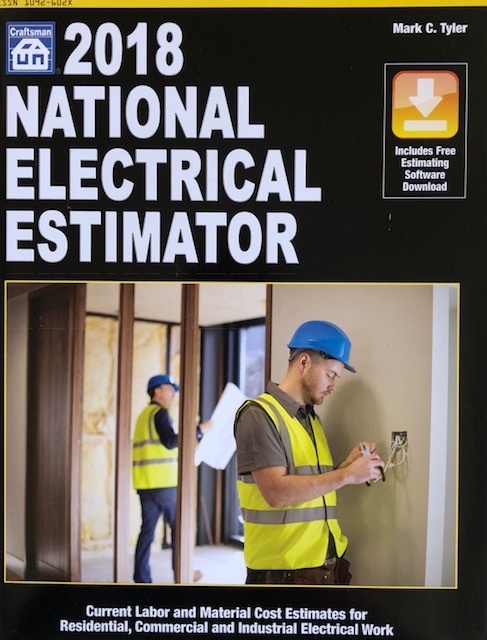 Includes a CD-ROM with an electronic version of the book with National Estimator, a stand-alone Windows estimating program, plus an interactive multimedia video that shows how to use the disk to compile construction cost estimates. Revised annually. in buildings. Includes CD ROM.